← What color should I paint the arches in my home? If you’re looking for a home in Charlotte, I’m sure you’ve heard these three words, location, location, location. So where is this “location?” It’s South Charlotte, NC. 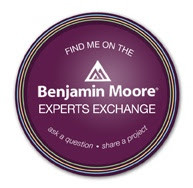 To be more specific, the best places to buy a home in South Charlotte is Marvin, Weddington, Wesley Chapel and Waxhaw. We all know that there many factors that determine where this “location” is but here in South Charlotte, it’s the houses! One of my favorite subdivisions, and I have several, is Skyecroft. 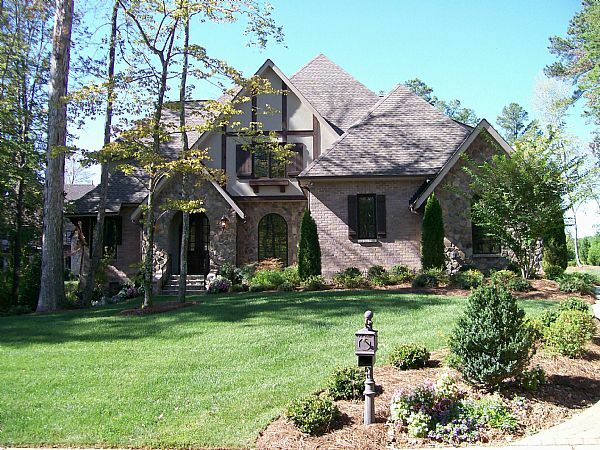 Skyecroft is a gated community in the Waxhaw/Weddington area which is a really great place to live. However, the reason I love this community so much is because of the style of the homes. Look at these! They are like small castles. It’s nice to see a coastal-spa like blue in this bathroom instead of the typical yellow-beige that you see in most homes for sale. It seems that the go-to-colors for many homes for sale are Blonde, Believable Buff, Whole Wheat, Restrained Gold – you know the list that I’m talking about. They are the Sherwin Williams colors that everyone uses because they go with just about everything and they are a “just there” color. However, it’s really refreshing to see an actual color that somebody had to think about in choice instead of just using a very safe beige. I love the way the light blue brightens this room and look how amazing it looks with the gray-white tile in shower. The contrast from the cabinetry and the diagonal floor tile really make this bathroom a beautiful design. If you notice, you don’t see any art or any decor on the walls either. 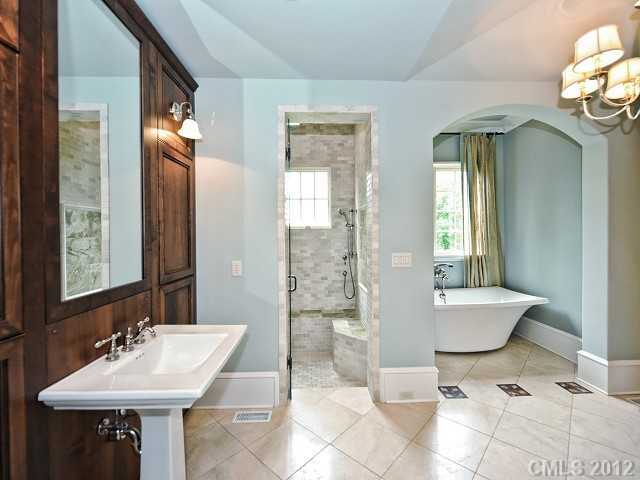 See how great color and bathroom design can stand alone? I’m not a big fan of beige kitchens but with a wood floor like this, the rest of the kitchen needs to stay quiet. Can you imagine if the builder used a regular, boring 12×12 beige tile in THIS kitchen? Here, you have the wood flooring as the main feature of the kitchen. I like it! I’m very familiar with this type of cabinetry. It’s really a bear to work with because it has an unusual undertone. 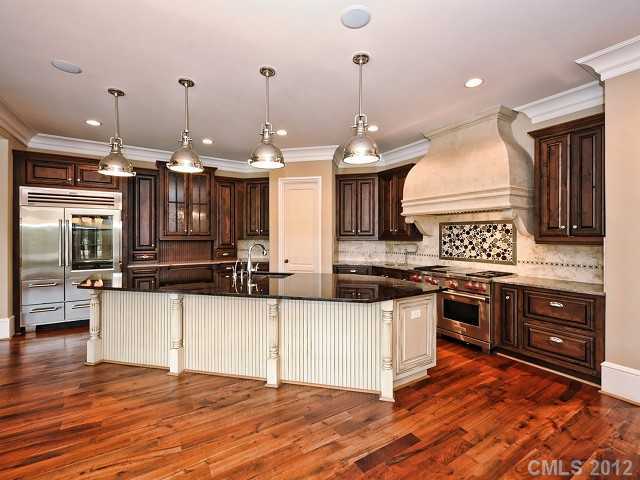 You can’t really notice it here in this picture because who ever designed this kitchen, did it well. 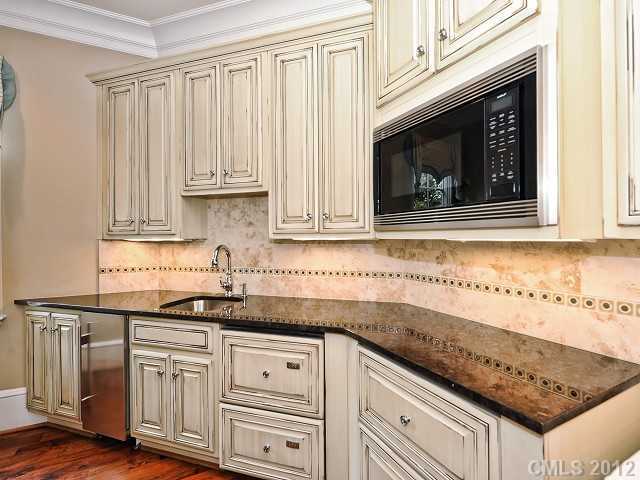 They chose paint and tile to coordinate with the cabinet color – undertone and all. Many times I’ll see a wall color that fights with this cabinetry and everything else in the kitchen dominoes down the drain so to speak. And back to blue. Blue-gray still remains so very popular here in Charlotte. I’ve written about it so many times. Although the color is really beautiful in this room, I think I would have chosen a color that was a little less noticeable. Here you have a very impressive ceiling which is nice but the drapery looks a bit odd to me. Again you see the beautiful wood flooring that was also in the kitchen which I like but it seems to compete with the ceiling. When you have so many major design elements in a room, which one will be your feature? 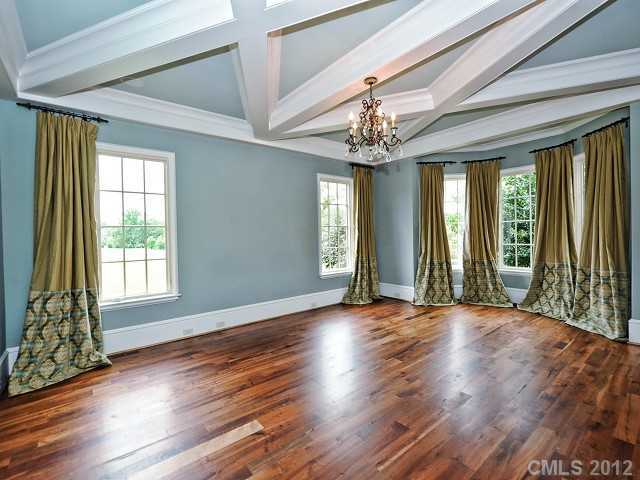 I feel you should have one feature in a room, and it can be anything from beautiful wall color to amazing drapery. 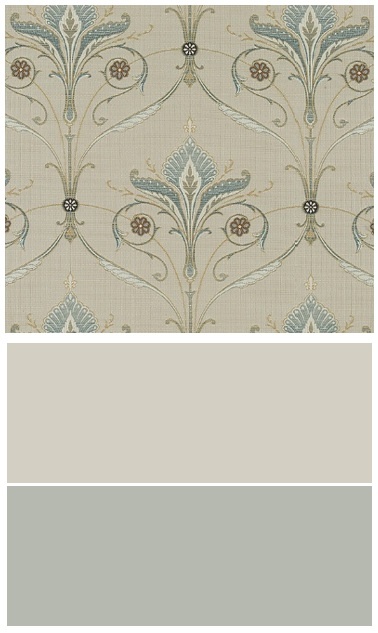 I would have gone with this fabric by CRLane with a color palette to match. The blue they have in the picture is pretty but like I said earlier, too much of a good thing is not too good. Wouldn’t this living room be stunning in these colors? Yes, it would! Choosing color for the homes in Skyecroft can be challenging but what a pleasure it is! In these well built homes, you really need to study the layout and the architectural features before you begin the color palette. If you just moved into the Skyecroft community and you need help choosing a color scheme for your home, please contact me. Experience is key in these homes to bring out there beauty. FYI: Please read a testimonial from one of my clients on Skyloch Drive in Skyecroft. 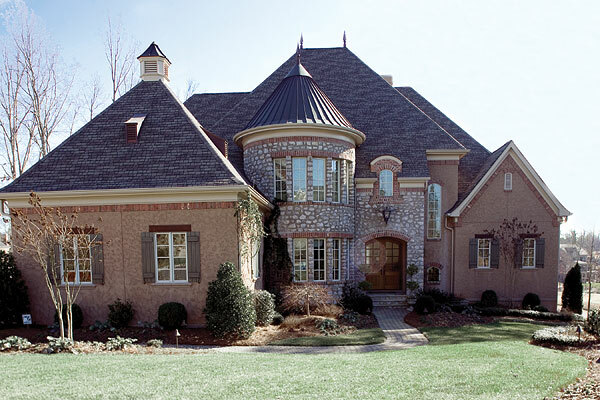 This entry was posted in Interior Design, Mansions, Real Estate, Sherwin Williams, South Charlotte, Waxhaw and tagged castle, large homes, location, Sherwin Williams, skyecroft, waxhaw, Weddington. Bookmark the permalink. 3 Responses to So where is location, location,location? South Charlotte, NC that’s where!